Hillary Clinton claims the Democratic presidential nomination Tuesday night in Brooklyn. Originally published Tuesday, June 7, 2016 at 11:44 p.m. 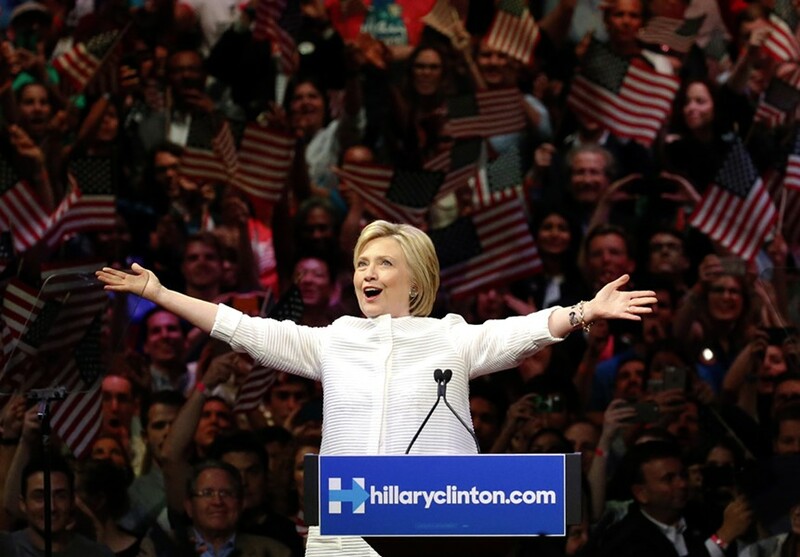 Updated Wednesday, June 8, 2016, at 7:55 a.m.
Former secretary of state Hillary Clinton declared herself the winner Tuesday night of a protracted contest for the Democratic presidential nomination. “Thanks to you, we’ve reached a milestone: the first time in our nation’s history that a woman will be a major party’s nominee for president of the United States,” she told supporters at the Brooklyn Navy Yard. 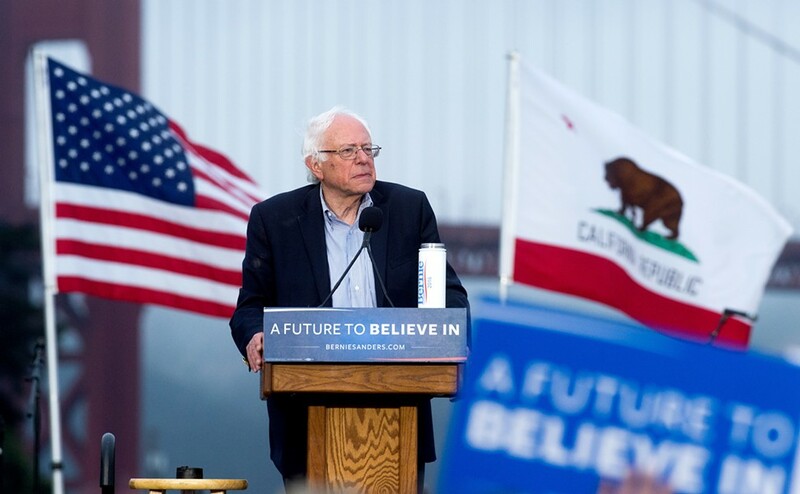 But hours later at a rally in Santa Monica, her persistent rival, Sen. Bernie Sanders (I-Vt.), pledged to “continue the fight” through the final primary election next week in the nation’s capital — and beyond. “We are going to fight hard to win the primary in Washington, D.C. And then we take our fight for social, economic, racial and environmental justice to Philadelphia, Pennsylvania!” he shouted, referring to the site of July’s Democratic National Convention. The competing declarations came on the penultimate day of voting in the primary election — after six states went to the polls. By early Wednesday morning, Clinton had been declared the winner in New Jersey, New Mexico and South Dakota. Sanders had been named the victor in North Dakota and Montana. Later in the morning, the Associated Press called California, whose 546 delegates made it the biggest prize of the day, for Clinton. She was leading Sanders there 56 percent to 43 percent with most precincts reporting. Including superdelegates, who can change their mind before the July convention, Clinton had accumulated 2,755 delegates by Wednesday morning, while Sanders had collected 1,852. A candidate needs 2,383 delegates to win the nomination. “This is our moment to come together,” Clinton said. Sen. Bernie Sanders speaks Monday night in San Francisco. Whether Sanders would heed her call was unclear for hours after she spoke. His campaign appeared to send mixed signals about its plans: The New York Times reported that the senator planned to lay off “at least half of his campaign staff” — but then it announced a rally Thursday in D.C. Even after he took the stage at a Santa Monica airport late that night, Sanders’ plans remained a mystery. Calling his California campaign “one of the most moving moments of my life,” he sounded as if he was preparing to concede the race. Sanders spoke for nearly 10 minutes before revealing that he would remain in the race — an announcement that prompted the biggest cheers of the night. “I am pretty good at arithmetic, and I know that the fight in front of us is a very steep fight, but we will continue to fight for every vote and every delegate,” he said. In his sole reference to his rival, Sanders said he had taken part in “a very gracious call from Secretary Clinton and congratulated her on her victories tonight.” He also noted that he had received “a very kind call from President Obama,” though he characterized it somewhat differently than did White House Press Secretary Josh Earnest, who disclosed the president’s conversations earlier that night in a statement. Sanders may face more direct pressure from the president on Thursday when the two meet at the White House at the senator’s request. Both Clinton and Obama aides have said in recent days that they expect the president to endorse Clinton and campaign on her behalf soon. Sanders, who plans to fly home to Vermont on Wednesday, concluded his remarks Tuesday night with a call to action. “The struggle continues,” he said.